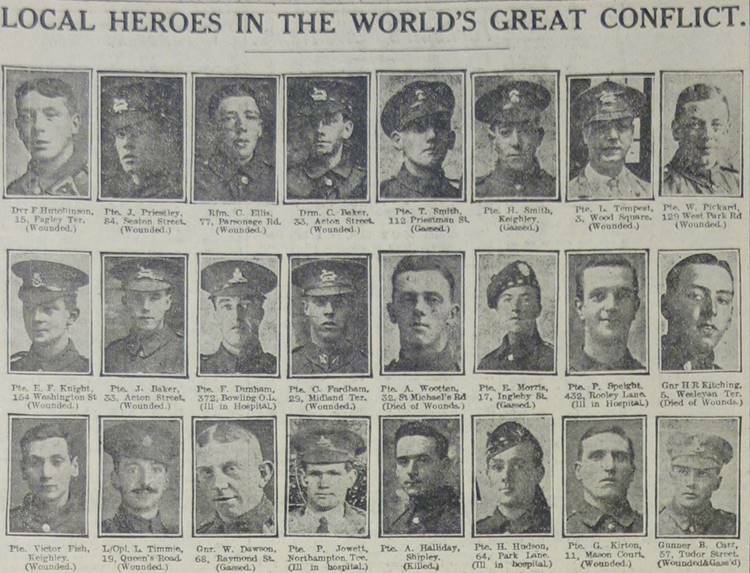 Beginning your research into First World War soldiers can be a difficult task but a search of a local newspaper can bring excellent results. This is especially so when a soldier was awarded a gallantry medal or became a casualty, whether being killed in action, wounded or taken prisoner. The best search results are for soldiers who were killed in action and reports of their death can usually be found within a month of a telegram being sent to their next of kin. Depending on where a soldier lived there may be multiple newspapers to check and there is always the possibility of a photograph of the soldier appearing. Below is an extract from the Bradford Weekly Telegraph, 19 April 1918. Nearly a hundred photographs of local soldiers appeared on this page alone, with most of the casualties being in consequence of the German Spring Offensive which opened on 21 March 1918. Though some newspapers have been digitised and are available to view online for a fee, the vast majority are only accessible at local libraries and the British Library. I would suggest starting your research by searching the digitized newspaper records on FindmyPast. As of January 2019, 29.7 million newspaper pages have been digitized and thousands more get added every month. 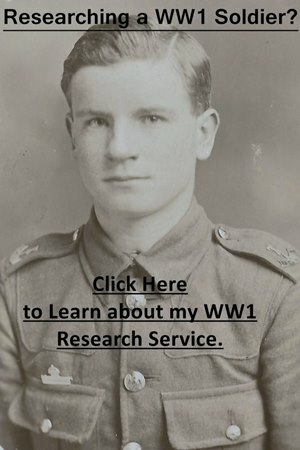 They include the War Office Weekly Casualty Lists from August 1917 to December 1918 which is an excellent resource. If you are searching for a photograph of an officer who was killed, then I would recommend looking at The Illustrated London News, The Tatler, The Sphere and Illustrated Sporting and Dramatic News. These papers have been digitized and can be searched on FindmyPast which has a free trial period by clicking on the banner below. If the newspaper you’re looking for hasn’t been digitized, I offer a research service to look up the relevant newspapers at the British Library. The easiest way to find a list of local newspapers is to search the British Library’s catalogue: Search the British Library’s Catalogue. Then search the location you’re looking for a newspaper from. After you search, click on “Newspaper” which can be found underneath Material Type on the left-hand side. This will remove all results which aren’t newspapers. Once you click on a newspaper header, click on details and there will usually be one or more blue hyperlinks, next to subject. These hyperlinks will enable you to search by county or city. For example, the subjects for The Manchester District Advertiser are “Greater Manchester (England) – Newspapers” and “Manchester (England) – Newspapers”. Clicking on the subject hyperlinks will display all newspapers which have been tagged for these areas. The newspapers listed will either be available as microfilm which can be ordered on the day or they will take 48 hours to arrive. When you search, bear in mind that initials were often used instead of full names and I’d also recommend searching addresses. Often, when one brother became a casualty other information was provided in the newspaper account regarding additional family members who are serving. The technology used to search digitized newspapers isn’t perfect and can often misread words. The information printed in newspapers wasn’t always accurate, so always try to cross-reference any facts where possible. Below is an example of a newspaper report I found for a client researching a relative who was killed in the First World War. Not only does the account provide extensive information as to how Maxwell Frank, a Lance-Corporal in the 10th Battalion, West Yorkshire Regiment, was killed and buried, but there was also the added bonus of a photograph. I am writing to condole with you for the loss of your son, Lance- Corporal Frank. I got to know him very well as one does those who share one’s dangers. He made many friends. He was the sort of cheerful boy who always does. He was always the man who helped others, and tried his hardest to make them happy. Apart from that he was a thoroughly good and trustworthy soldier, and had been marked by his company commander for early promotion. We all feel his loss deeply. I was present at his funeral. We buried him in a beautiful cemetery just west of—–. While the simple service was being read, the guns of the battery just behind us were roaring a fit requiem for a soldier. A cross is being erected by the regiment at the head of his grave. It may be a comfort to you to know that death was instantaneous by the bursting of a shell. Any particulars that I have left out that you would like to know I would be very pleased to give you. I regret to inform you that your son, Lance-Corporal M.Frank passed away on the 15 instant. He was on duty in the front line trench, and died without pain, his death being instantaneous, the result of a shell bursting close to him. It will be a comfort to you to know that he was buried quite respectably in a village behind the line, the name of which I will tell you later. Your boy made many friends in the company, and we tender to you our heartfelt sympathy in your great loss. 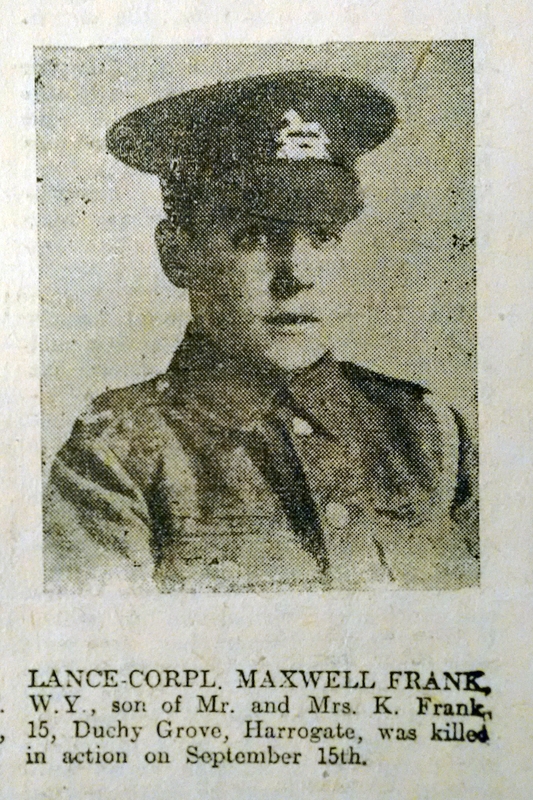 I have got his cap badge and photos, and will forward them to you at the earliest opportunity. Considerable shelling of trenches of Hebuterne. Gas was discharged from the 2nd and 17th Divisional fronts, but was not noticeable in our lines.